Where are the bodies? 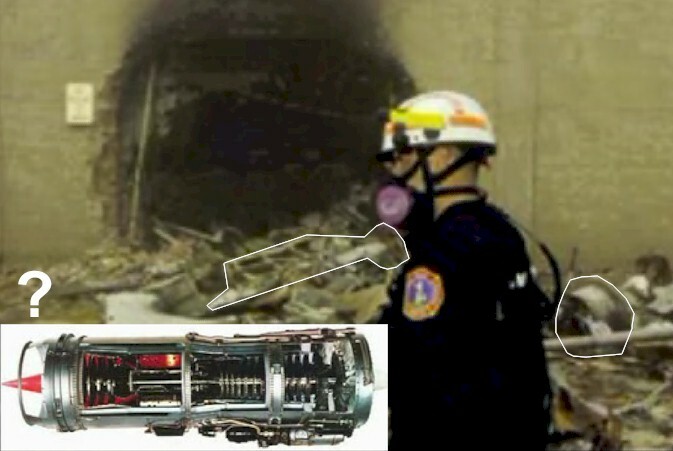 Supposedly 100 Tons of steel and titanium alloy completely disintegrated, yet, government forensics teams claim to have identified 180+ bodies. This is just on ‘paper’. 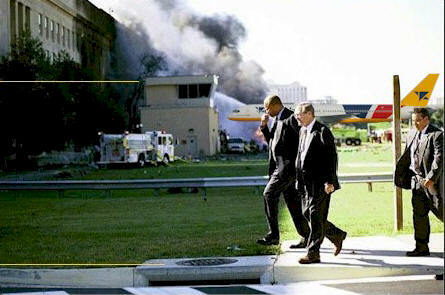 No witnesses saw any bodies, no witnesses saw damage consistent with a 757 slamming onto the lawn and Pentagon. 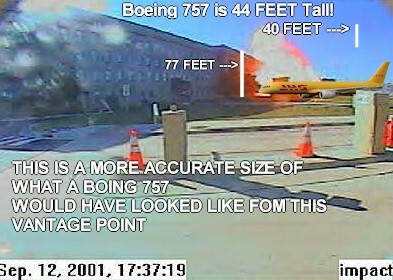 If you saw the tape that the Pentagon claims shows the Boeing 757, you can see there is no 757! It is laughable, if it wasn’t so horrific. 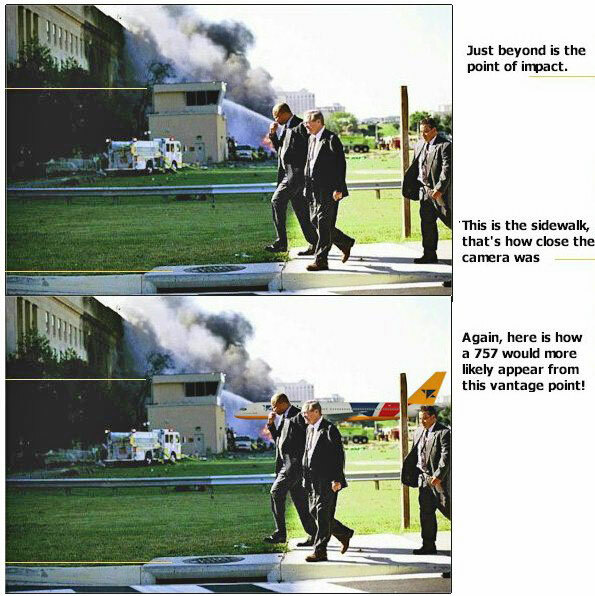 They claim you can see the nose of the 757 in one of the frames, however, if you apply scientific laws of distance and size, it is obvious that this is no Boeing 757 …In fact, it does have the dimensions of a small drone or missile. 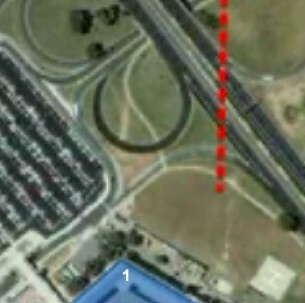 This above picture reveals the distance that the security camera was from the scene of impact. 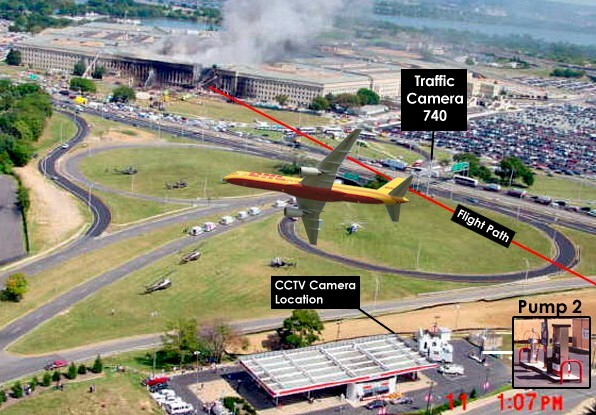 Not to mention, their were many cameras that would have caught a clear picture of a real 757 so close to the ground, highways, buildings, and Pentagon. Below is a segment from same picture X’s 600. You can determine what is a solid object, and what is not. 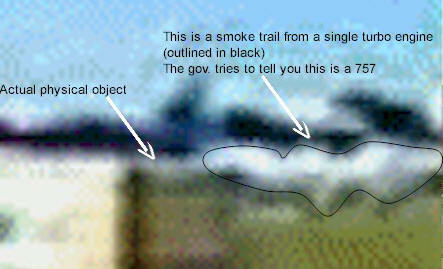 You clearly see a line of dense (but not solid) white exhaust, trailing a solid narrow lineal object. This more what a Boeing 757 would look like if it were the actual object in the frame. 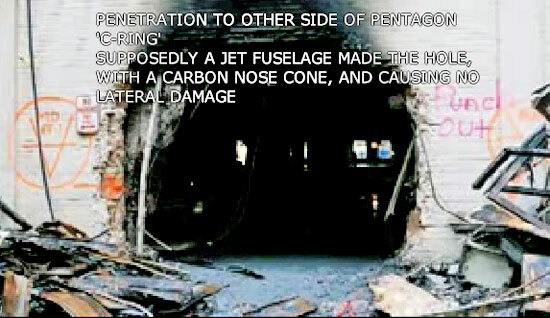 Remember… The collision into the pentagon was exactly perpendicular, like a missile strike, not ‘bombed into’ like a kamikaze airplane strike. 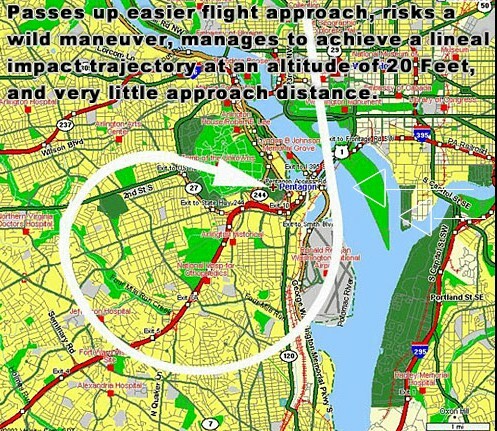 Not to mention, the incredible skill necessary for a pilot to achieve such a narrow band of altitude… Like a cruise missile, in the middle of Washington DC. A Boeing 757 is 44 tall. Airliner Dimensions. 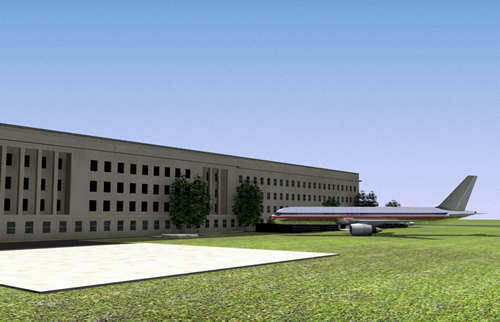 That is over half the height of the Entire Pentagon Building, which is only 77 Feet Tall. With all the cameras taping the Pentagon, isn’t it odd they cannot prove it, and release a paltry few frames, only after federal judgment makes them? LOOK CLOSELY (above image), …This is the picture the administration does not want you to see! Look at the red image, it is scaled to size, (ACTUALLY EVEN SMALLER) and shows where the impact patterns SHOULD be, yet, there is no damage except a single hole that goes through 3 sections of the pentagon. 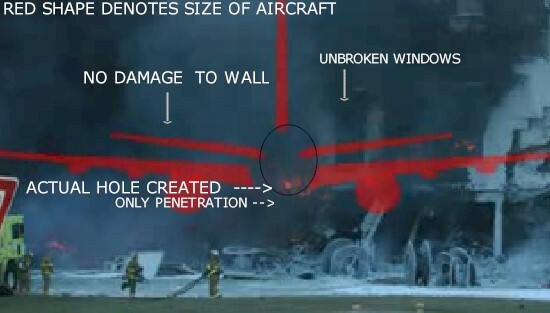 This wall collapsed or was brought down by explosives minutes after this picture, which clearly shows inconsistent damage for a Boeing 757. 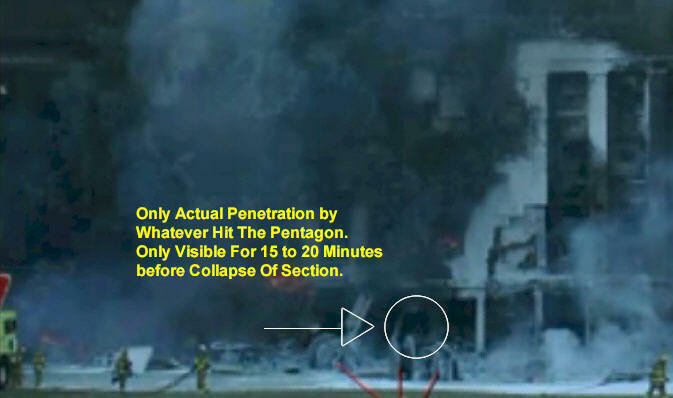 Given that the outer wall of the Pentagon had not yet collapsed and the only hole is approximately 16 ft. in diameter, how does a plane over 44 feet tall and 125 ft. wide fit into that hole as shown in the photographic evidence from the Pentagon? 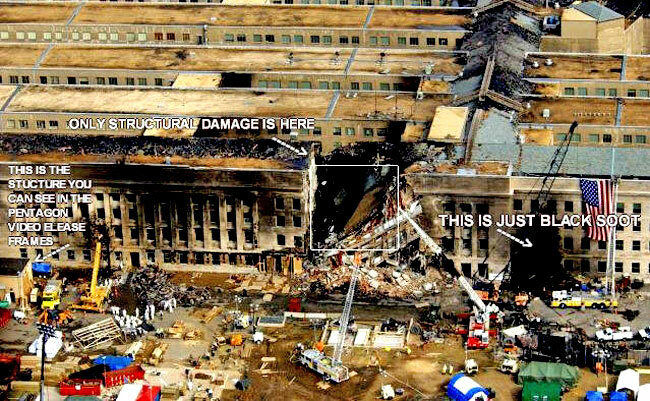 Furthermore, can physics explain why there is no damage to the Pentagon’s upper floors where the tail section would have hit? Close-ups of this section are extremely revealing. 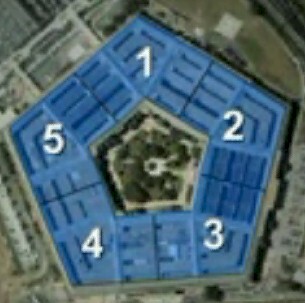 Why were America and the world never shown the video and photographs of the Pentagon, BEFORE the outer wall had collapsed showing only one 16 ft. hole. 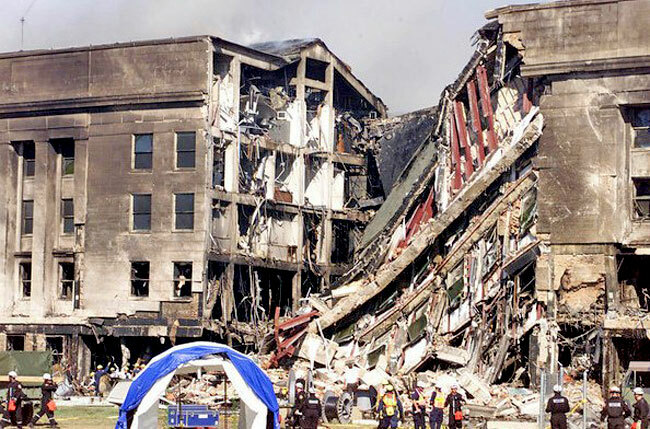 Many people do not realize that the outer wall did not collapse until almost 30 minutes after the initial impact. How does a Boeing 757, constructed from lightweight aluminum, penetrate over 9 ft. of steel reinforced concrete with piercing clean round holes, and leave no evidence of itself? A 757 Did this? …if it wasn’t so horrific, it would be laughable. Now, 30 minutes after the missile pierced through 3 steel reinforced walls, leaving the hole shown in the picture above as it exited the last wall. Are we supposed to believe it got hot enough to melt a 757 airliner, including two 6-ton titanium steel alloy engines? Not to mention, the 757 supposedly disintegrated, yet, you can see un-burnt desks, and un-melted computer screens immediately next to the impact sections. 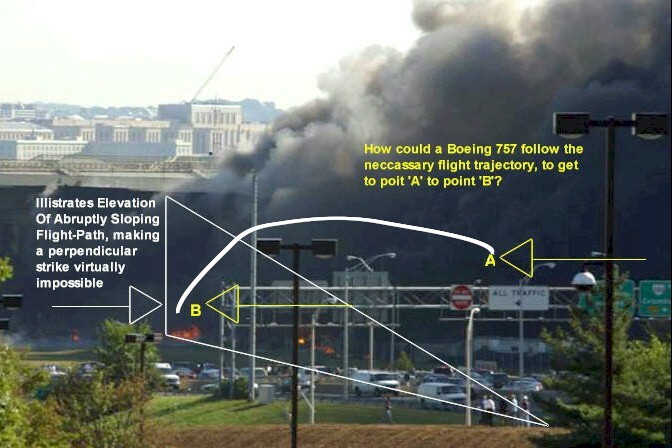 How could a 757 clear highway structures at A and manage to strike point B without touching the ground? Physically impossible! 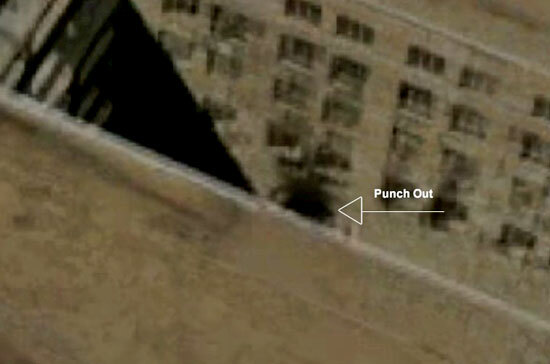 A giant 100 ft. crater was plowed into the front lawn of the Pentagon as the result of a powerful airliner crash? Why does photographic evidence overwhelmingly show that this was absolutely not the case? Why was the entire world deliberately mislead? 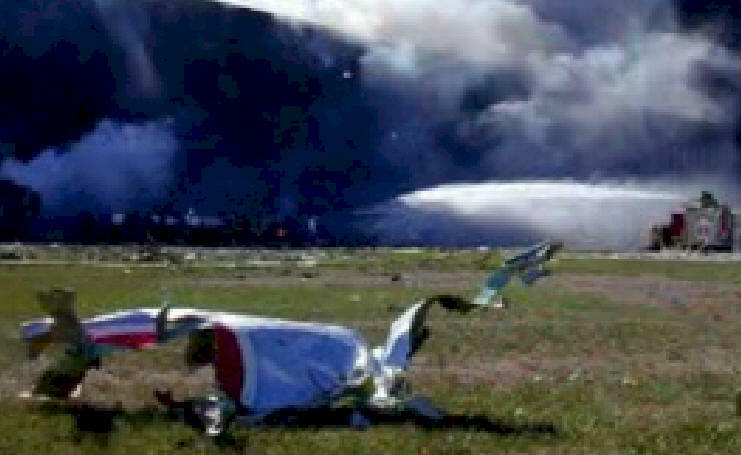 There seems to be a few ‘clean & placed’ pieces of plane, small enough to carry off, the lawn, which was undisturbed. And of course, these ‘pieces’ have since, conveniently disappeared and cannot be analyzed. 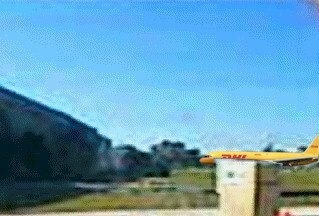 But unfortunately, it is not from a Boeing 757! 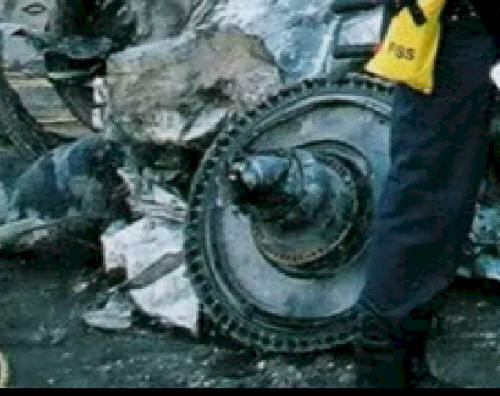 Official reaction to this photo/part, was to claim it is a HoneyWell rotor from the rear ‘APU’ engine in a Boeing 757’s tail-section. Karl Schwartz, former GOP Stratagist, Patmoz Nanotechnologies Inc. security systems CEO recognizes the part as a JT8D Turbo from from a US Air Force A-3 Skywarrior. 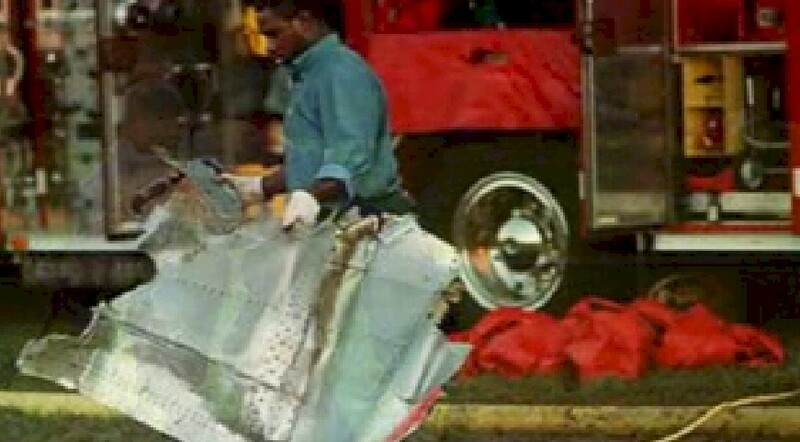 The only piece of wreckage that appears ‘genuine’ in the FEMA photo is the front shaft-bearing housing from a US Air Force A-3 Skywarrior, or something very similar. Only 4 or 5 still existed on 911, and they were stored at Hughes Aircraft in Van Nuys, CA, now better known as RAYTHEON, a big war profiteer. RAYTHEON Corp. has been in this site, here is the proof. Raytheon employees with possible links to Global Hawk can be connected to three of the four flights. There may be more, since many of the passengers’ jobs and personal information have remained anonymous. A surprising number of passengers, especially on Flight 77, have military connections. For instance, William E. Caswell was a Navy scientist. Could these Raytheon employees have been on board to activate Global Hawk technology, or make sure it worked? 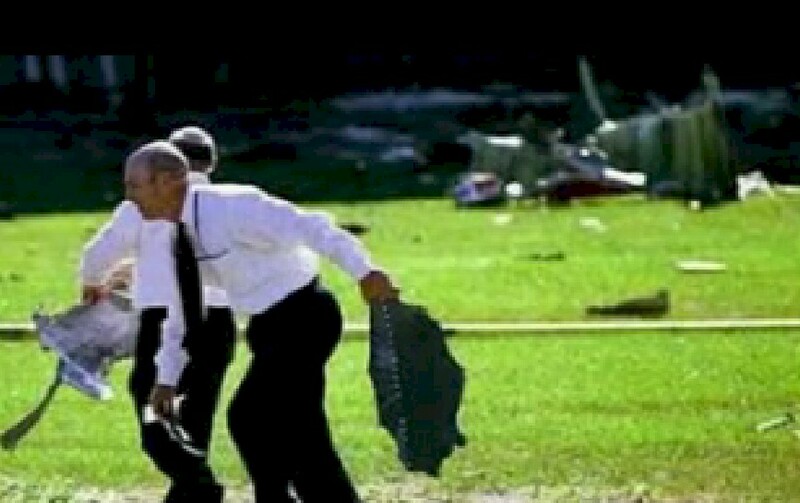 Why does photographic evidence taken only a few moments after the Pentagon event show no wreckage on the lawn of the Pentagon? Where is the tail, the wings, the luggage, the seats, the landing gear; the engines? No one reports Bodies …They are just on paper, supposedly 177 or more bodies were identified, even though their are no eyewitness reports. Not to mention the fire was so hot it supposedly incinerated 100 tons of Aluminum and titanium steal alloy. Pentagon always was my favored you seen this one yet! 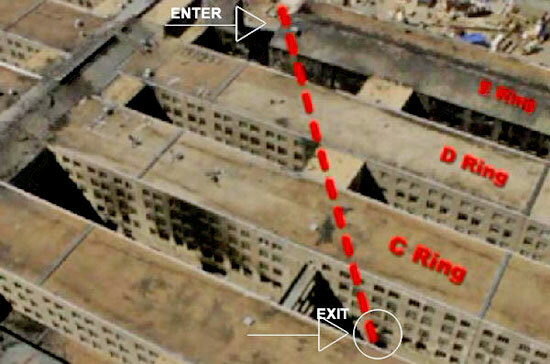 About the video: I have the found the proof of editing by the pentagon. There was another bit of footage that day that shows the missing 4 seconds that were edited out of the official Pentagon release. See the footage that shows the truth and the actual impact. NOTE: After watching this I realized that you can still see the shadow of the object over the lawn yet not the object. Watch the slow motion carefully! For more information: see above report. This is quite something that people think so outside the box to investigate in this manner. This guy deserves kudos for something that really is so easily missed by most people but he caught it. Watch and realize that he clearly proves that frames have been removed by the MSM in order to further their propaganda of the 9/11 story. And some are calling it into question, but the fact that the frames missing are actually shown is needed to realize how the official story is pushed on us constantly. People who know what they’re looking for need to do this kind of research and realize the holes in which exist in the official story and expose them. Something like this a bit bigger!